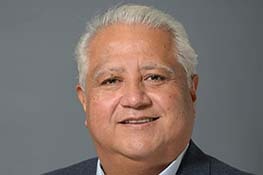 As president and chairman of the Cesar Chavez Foundation, Paul F. Chavez has spearheaded the impressive expansion of the organization his father founded in the 1960s. The Foundation has grown and adapted into a successful group of social enterprises that support hundreds of thousands of Latinos and working families, inspiring and transforming communities from rural to urban areas throughout the Southwest and across generations. One of eight children of Cesar and Helen Chavez, Paul has spent his entire life with the farm worker movement. Prior to his work with the Cesar Chavez Foundation, he served with the United Farm Workers of America as a union organizer, contract negotiator, political director, lobbyist in Sacramento and Washington, D.C. and director of marketing operations. He was also a personal assistant to Cesar Chavez. Paul earned an A.A. degree in negotiations and collective bargaining at the Fred W. Ross Labor Education Center’s School of Collective Bargaining.